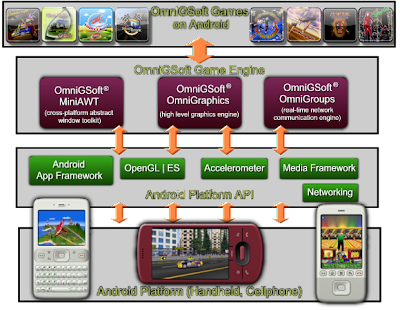 "OmniGSoft Games on Android" is OmniGSoft's entry for Android Developer Challenge, which consists of ten independent 3D mobile games for Google Android Platform. All games are designed and implemented on OmniGsoft's proprietary cross-platform 3D game engine that supports multiple mobile platforms such as Android, Windows Mobile and JavaME. Powered by OpenGL|ES as 3D graphics power plant and Android accelerometer as an alternative game control, these mobile games are aiming to provide the highest quality of 3D graphics and gaming experience on Android platform.